I will say my first craft love is crocheting, just love wielding that hook. I sewed on and off for several years, but no where to the extent of making unique garments. My sewing style was geared towards home decorating, curtains, duvet covers and pillow slips. 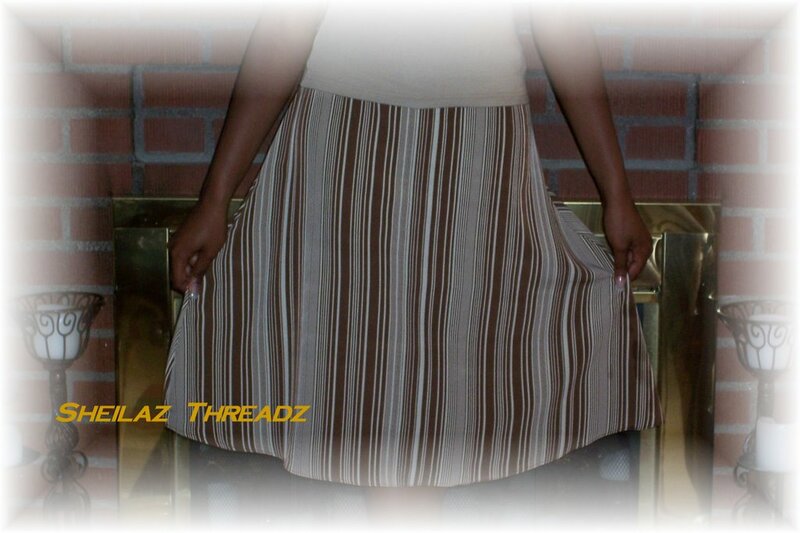 Last year I made a Skirt for my daughter and she's still waiting for the other skirts I vowed I would make...lol. As you know crochet took first place and sewing was put on the back burner. When my daughter was younger, I would take her little outfits and embellish them with appliques and whatnots. We still oohh and ahhh over an outfit that I refashioned... It was a denim jacket and jeans... I had purchased some appliques, two of them were in shapes of a gumball machine that was all glitter and glam, with sequins and other glittery notions on it. I sat there and sewed the applique on to the back of the jacket and sewed the little gumball machine on the leg part of her jeans. Well, you couldn't tell my kid she wasn't chillin' and mackin'.. it was too adorable. I must say I grabbed the attention of a few moms who wanted to know where I'd purchased the outfit... told them I dabbled in embellishing and for a while I was refashioning outfits for her friends... it was fun. When she'd outgrow her jeans and long sleeve tops.. I would refashion the jeans into shorts and the tops into short sleeve tops, sometimes adding cute trimming. When I lived a more social life, that required attending formal functions... I would buy outfits and embellish them with rhinestones or sequins or whatever caught my fancy. 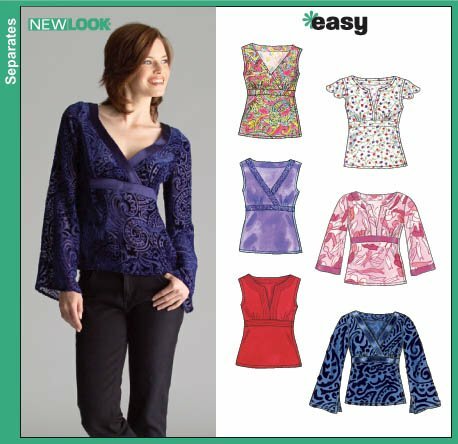 I brought 2 New Look patterns, 6571, which consist of Dresses, Top, Camisole, Skirt and Sash, and 6515, which consist of Tops. The fabrics are b/w floral georgette, white lace, blue stretch knit and embroidered batiste. So you know what was next.. cleaning up my little sewing area... which usually holds court for my hair paraphernalia... hair dryer, hot curlers, rollers and whatnots... lol. Ohhh.. yes I do wash & set... lol. Well on to trying my hand at sewing. I can't wait to see what you make! Yeah, I've been to Joann's on Saturday & was like "WHAT is going on??" LOL. Sheila, can't wait to see what you. Sew on!!! Hey Sheila! I love your new site! Dag, it seems like everyone is updating their blogs. It looks great! I can't wait to see what your next creation is. You are definitely bringing crochet back! I always wanted to ask you, how do you create your garments? Do you just start crocheting and write your patterns down as you go along, or use a software to create your patterns? Your pieces are amazing, and I'm always amazed by your creativity. Girrrlll, you better watch out! Good luck with the sewing. Those are some cute looking patterns/outfits. Be sure to update us when you get them complete!